As you all know I have been on an extended vacation from blogging. I feel like it's like any other job or task sometimes you love and sometimes you DON'T. I read several blogs and some are just not giving me enough. I mean when I read or write a blog for me it's about being as REAL to my readers as they are to me. So let's just say I was feeling a little "discouraged from blogging" and leave it at that. I guess sometimes you just have to be the change u want to see in the world and hopefully everyone or at least a few catch on. So enough of that This week I attended a baby shower of a great friend of mine and decided to keep the attire simple and chic without breaking the bank. I more than likely always wear jeans to baby showers in fear someone will request me to play a game that requires me to have on pants. You can't go wrong with a maxi skirt or jeans because I try to win every single game. I decided on both pieces from asos and they both were ON SALE which was even more of a reason to pick them up! I'm always getting questioned about my choice of lipstick or gloss this gloss is Asian Flower by MAC. I basically wear it almost everyday and it's pretty neutral to me and not to overpowering how some pink or red lipsticks seem to be. QUESTION? COMMENTS? LEAVE YOUR OPINION BELOW! Love the outfit!!! How does this ASOS top and pants run? True to size? 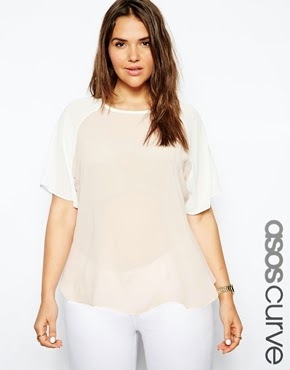 believe it or not asos curve runs pretty big i actually covered this on my youtube video a while back. if you want u can look it up under my name on youtube! So cute! I love this look. Soft and feminine, yet comfortable and functional. You look great! I love this look!!!!! I'm all for wearing all white (or netrual shades with white)!